The weekend has landed and all that matters now is clubs, drugs, pubs and parties. You've got 48 hours off the 9-5, it's time to unbutton your hustle and breathe vigor back into life. Whether it be through losing your soul on the dance floor or grooving to it, we have your soundtrack covered. The EARMILK Weekend Selector, an exclusive guest mix series where we invite the latest budding talent from behind the booth to usher you through all the boozie and jam. From your morning bedside to tonight's evening formal, your weekend selector is here to fill a void of good taste and allow fresh connections to flow vicariously. Following in the tradition of deferring to some of our favorite techno artists (see Hrdvsion, Matt Walsh) to helm the reigns of our little mix series this week we turn things over to Meant Records boss Remain. Fresh off his "The Beast With Two Backs" release on Walsh's Clouded Vision imprint (see an in depth review HERE), Remain gives us a mix full of burners we've been waiting to get our hands on. My Favorite Robot/Turbo/More Music alum Jordan Dare on Zhao's Anozer label in particular. Look for it around the 10 minute mark. Follow that up with Minus/Items And Things artist Click Box new ish for Clouded Vision and a preview of some new Remain on Relish and this set quickly reaches set rip worthiness levels of a Joy O appearance at Boiler Room. We don't condone that ish though, sit back and enjoy the mix in it's full 320 glory while we go in deep on and interview with monsieur Remain. EARMILK: Why don't you start by telling our readers that are new to your catalogue a little bit about your label, Meant Records. 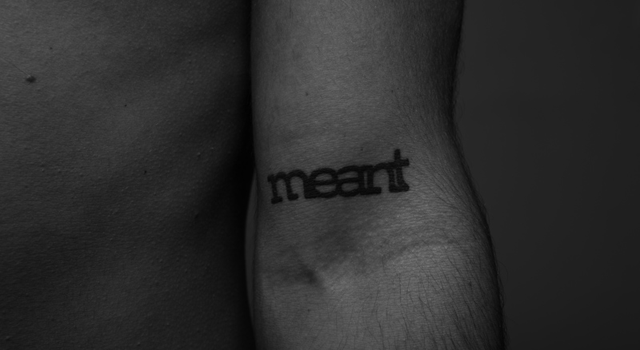 Remain: Meant is a 4 years old Paris-based records label, and we’re now working on the 13th release planned for September. The initial purpose was to set up a structure that would defend all kinds of music we’re into, with no boundaries for each or any genre, till they are part of a very strict and coherent A&R position, whatever the reality of the music market today! We’re making music, producing music and developing artists that we strongly believe in only. I have to say that I’m really proud of the artists that gave us their trust such as Rework (our new signing – MEANT013 in September), Clouded Vision, Monoblok&PSLKTR, Vosper, Remote and also of the remixers that agreed to deliver bomb reinterpretations of the original music such as Ewan Pearson, Ivan Smagghe, Krikor, Chloé, Tim Paris, Kiki, and Rebolledo among others. You can expect another big EP in September with Rework’s brand new record after years of silence since their Playhouse/Output period! EM: On your last album "The Beast With Two Backs" you worked with Matt Walsh's Clouded Vision imprint. You guys have bounced a few remixes back and forth, how did that relationship start. R: We met 2 years ago when Matt sent me his “Clouded Vision – Room101 EP” for Meant. Just one hour later: the EP was signed! Then we began chatting about music and sharing tracks all the time and also inviting each other to parties in our home cities in London and Paris. He asked me to remix a track from ‘The Countach’ called "Melvin Never Made It" released on his Clouded Vision imprint and I also asked him to remix my "Concrete" track (released on French label Family N.A.M.E). He’s now a good friend of mine, and I always ask for his thoughts when I finish something. That’s how he jumped on ‘The Beast…’ when he first heard it. It was, of course, a pleasure for me to give it to him for Clouded Vision. He’ll also be my guest at the next Meant Night at Showcase Club/Paris on June 15th alongside another artist I’m very fond of: Mugwump. EM: In the original track your lead is a snappy open filter sound that stays clear of a lot of post effects and lets the synth take center stage which is a departure from the really closed off filter sound that's the trend through the UK scene. Was it a conscious decision to take things back to basics a little bit? R: Haha, not at all! This track came quite fast, I have to say, and definitely without any secret purpose! But listening back to it and analyzing it now a bit, I totally understand why Matt liked it as soon as he listened to it too. To be perfectly honest though, I’ve been willing to do a straight 4/4 club track like this one for a while. Something that would develop around a loop and a synth pattern as simple as possible without being boring, and transmitting the right energies at the convenient moment. I always tend to do way more complicated, dark and charged tracks on a regular basis, more leftfield and indie influenced things, so maybe I just needed to explore this trend too. Don’t really know! EM: Is there a piece of gear in particular (software or hardware) that you've picked up that you've been using or that you couldn't live without? R: There’s one I instantly think about but it’s absolutely not music related! I just got my old English motorbike back from the garage and after more than one year without it, it’s a real pleasure to have it back, especially with the nice spring weather. It’s an old Triumph Speed Triple I’ve spent my college years saving money for. Now that I have it back, I couldn’t stand it to be broken again! EM: What are your summer plans? Any tours, festivals, remixes coming up? R: First of all, I need to rest and spend some time without music right now! I’ve done lots of tracks and remixes and touring for the past 2 years, without taking some real vacations so that’s what I’m going to do in July (at last). Before that there’s another release planned for the end of June on Headman’s Relish imprint with 2 original tracks – one with Matt Walsh’s vocals called ‘Insame’ and another one called ‘Dead&Gone’ – and remixes from Headman himself and Rework! Can’t wait for this one to be released! Then back on track for this new project with my friend Electric Rescue: We have an EP to be released on Oliver Huntemann’s Ideal Audio (with a Marc Houle remix) in September and before that we’ll play our live set at Astropolis Festival in August. So we have to finish working on it! Also lots of things in the pipe planned for the end of the year with Populette (on Meant), Max Pask (on ThroneOfBlood) and also a solo I’ll tell you about in a while. EM: Are there any particular songs in the mix that you've playing a lot lately that you'd like to shout out? R: This podcast has been recorded in live conditions (one take, no editing, 100% real mixing), under the sun at my friend GillesDeGivry’ house in St Ouen (Paris). Was a wicked moment to do that at his place, feet in the sand! I wanted it to reflect the sounds you’d hear in my regular sets but this time (quasi) only from people and labels that really matter to me (Max Pask, Click Box, Electric Rescue, Tim Paris’ Marketing Music) completed with DC Salas’ remix of ‘The Beast With Two Backs’ (released last week on Clouded Vision) and a few exclusives such as the amazing Rework remix of my track Dead&Gone (to be released on Relish late June)! 07. ????? – ????? (????? ): ????? 11. ????? – ????? (????? ): ????? Grab Remain's latest release "The Beast With Two Backs" to ring in the hot summer. An EP spelled with seductive grooves from top to bottom from the likes of disco revivalists including Belgium's DC Salas and Futureboogie's Lukas. Make sure to check out the Meant records catalogue for some further digging in the mines of our Weekend Selector, it surely won't disappoint.